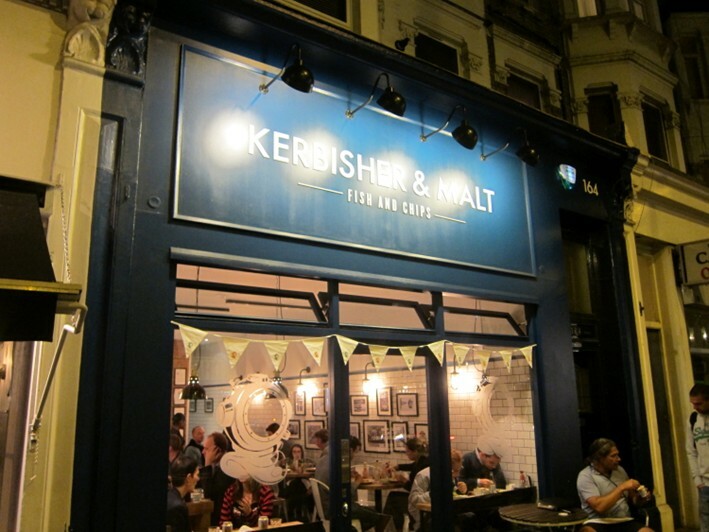 Kerbisher & Malt opened in the spring of 2011 in Brook Green, set up by Saul Reuben and Nick Crossley (a chef formerly at both the Oxo Tower and Racine, and his brother in law respectively). It serves fish and chips and the usual associated items, but keeps a relatively tight menu focus rather than straying far from these traditional roots. In case you are puzzling over the name, Kerbisher is the name of a fishing boat (owner Nick's grandfather was a Norfolk herring fisherman). 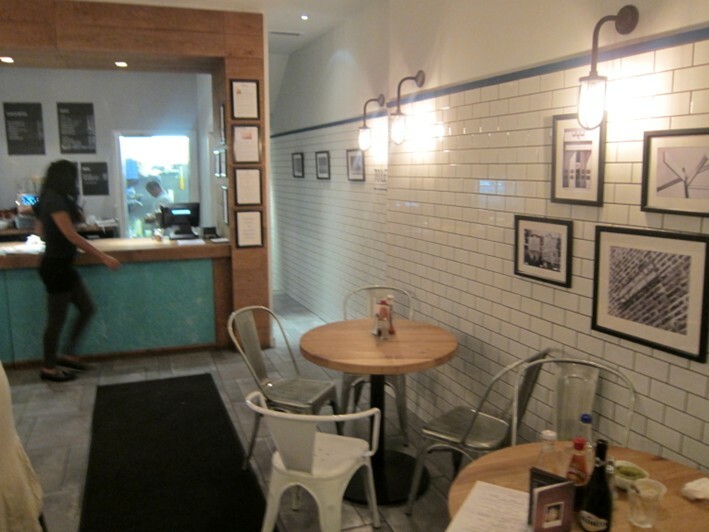 The dining room has walls with white “metro” tiles, some black and white prints and bright lighting. It is a fairly narrow room with a desk at one end where orders are placed; there is no waitress service other than to deliver the food and drinks. Somewhat surprsingly, in the dining room on one wall there is a video link through to the kitchen, where you can see the chefs working. Apparently a wine list is planned, but this was not yet in place when I visited, though beer was available. A fishcake (£3.50) was clearly made from scratch, and had a good filling, with visible pieces of fish; the batter was also crisp, avoiding the greasiness that so often afflicts this dish (12/20). Haddock (£6.10) and chips (£1.60) had good fish and a crisp batter. Chips, though only double rather than triple cooked, were pleasant and above all crisp, a rarity in London fish and chip shops (12/20). These were a little let down by tartare sauce that appeared to be made from scratch and yet was surprisingly tasteless, and mushy peas that similarly lacked flavour (10/20). The bill was £13 a head, and this included drinks. The waiting staff were friendly, and overall I thought this was a very pleasant experience. 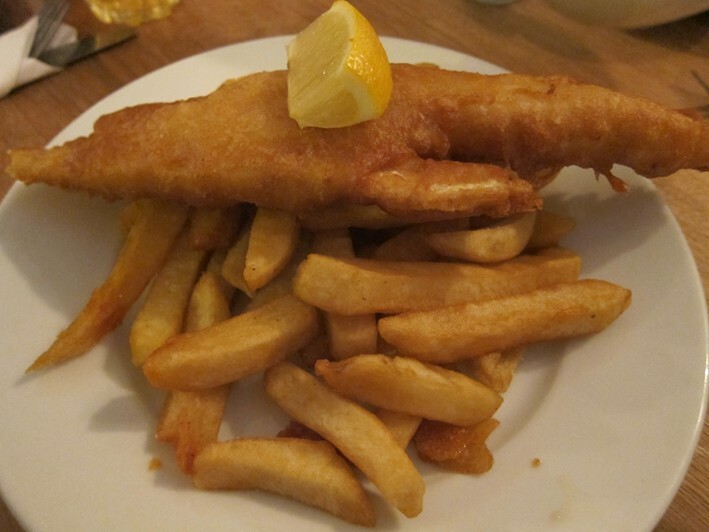 It is remarkably hard to get decent fish and chips in London, so it is nice to see a place delivering a capable version of this classic British dish.